First of all, welcome to everybody who saw the piece on us in the New York Times. May I suggest a turn through the archives? Lots of fun to be had there, as long as you have a high tolerance for bad puns. As you all know, we finally finished the foundation this fall. Our last inspection was this last week, and we hope to be done done done with it very soon now, contracts all completed and permits signed off. 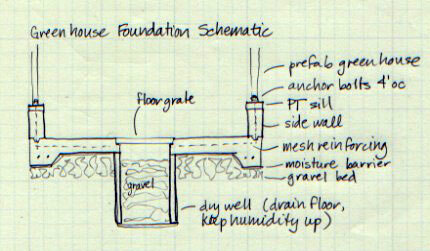 So of course in the next few weeks we are contemplating another foundation job. Before you have us involuntarily committed, we're not touching the basement. We're not touching the house. Instead, we are beginning to wrap our minds around the concept of actually putting in a greenhouse, and the greenhouse needs a foundation. 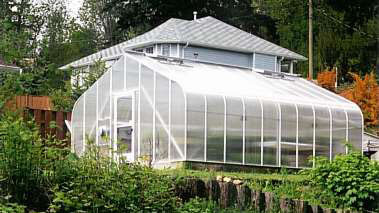 The greenhouse we are planning to purchase is a Cross-Country greenhouse from ACF Greenhouses. Curved eaves, decorative finial thingie on top, double doors. Very Victorian, but also very functional. I'm vacillating between the 10' x 12' and the 8' x 12' sizes right now, though in general I think narrower works better in a greenhouse than wide does, but with the table in there, maybe we want more width? So on and so forth. The one pictured here is really large, like 16' x 20', and that is totally out of the question. 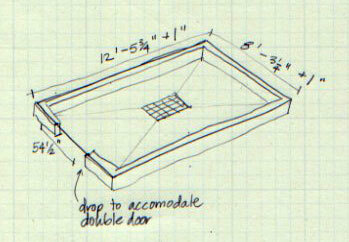 Anything over 120 square feet needs a permit with drawings. Not going to happen, not to mention that I like my yard. We need side walls to accommodate the double doors, so the doors can come down further than the base of the greenhouse and fit into the narrow opening. Also, I like the look. Double doors help when you use the greenhouse for overwintering large plants, as we plan to do with the coffee tree and a few more exotic fruits. You can get things in and out far more easily. The floor will slope gently to a central dry well, which will keep water from collecting in there but also provide humidity. With the sump under the house sucking the yard dry, drainage for the greenhouse is not going to be a big issue. Noel wants to practise concrete finishing for the floor by making some stepping stones for the garden, so we'll see when we actually get around to both a) deciding on a size and b) actually staking this thing out. I have a week off coming up, so maybe then. Or maybe some weekend later this spring when the rain is tapering off, seeing as right now the heavens have opened up on us every weekend for the last three.